Have you always wanted to control one of your own? And… can you type fast enough to survive?! In this game, a single typo can kill you! Prologue: What is this? Will there be Dragons? Welcome fellow Game Makers to this brand new series in which I will be looking at games made using both Game Maker Studio 1.4 and Game Maker Studio 2. To be specific I will be looking at games that are either Work in Progress or Early Access and try to provide constructive and honest feedback to the developers to help them with their development process. If you want, you can watch this video that explains my motivation behind this whole series. 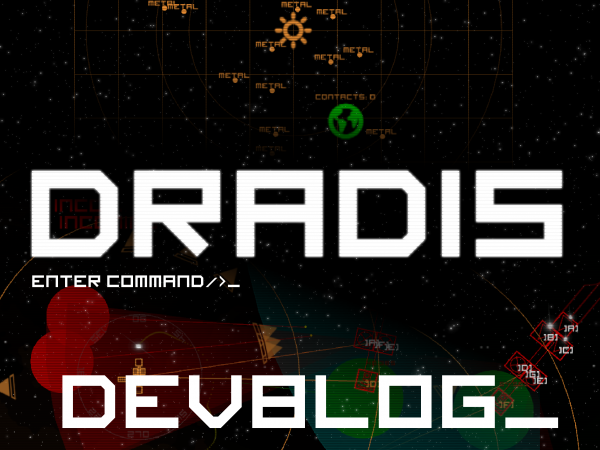 Our first game on the list is DRADIS, a Work in Progress space simulation game where you control your spaceship by typing commands to the Command Console! Yes, you have to type what you want the systems to do. Doesn’t sound exciting? Maybe even boring? Well let me tell you that it is MORE ACTION PACKED and FAST paced than some 3D space simulators you can play. How? Well, try to type in REAL TIME (well there is Tactical time, but on that topic later) commands to steer your ship, lock on to targets, control your engine throttle, power up shields and fire your weapons… Doesn’t sound so slow and boring now does it? So how was the Gaming experience? When I started the game, the tutorial started straight away. Awesome! I learned how to control my ENGINE, how to change HEADING of my ship, how to use WARP, the MAP and most importantly how to LOCK on TARGETs and FIRE my WEAPONs (all the words in CAPITALs are commands for your ship *wink wink* ~_^). But I remembered!! I had to type in HELP to invoke a window that included all the commands I needed for the game. Only after reading the HELP screen couple of times I was comfortable that I remember all I needed to go on a space journey. Once in space on my own, I started the tutorial that was giving me objectives to complete, to reinforce the commands. I have to say I was impressed by the developer including such a neat tutorial, it basically taught me everything. When I saw the visuals I was pleasantly surprised how good the game looked. Simplistic but very clean design of the User Interface, of the Ship, Space Station. But the main things were the graphical “glitches” that kept happening. This gave the game a new dimension. It was suddenly not a standard “space simulator”. The graphic effects gave me the feeling that I am an operator, sitting behind his console screen, observing the ship by external drone camera and giving it commands. Suddenly I was a captain of a ship, or at least a commanding officer in charge of the task scheduling for other ship crew! The goal was to take control of enemy Space Stations in the system. There were two of them, I knew what to do. I checked the map and set my heading, it was time to engage the warp drive! My first encounter with enemy ships, I got excited. In the game there is Tactical Time (TACTIME) that allows you to slow down time, but only for limited time, so you can manage your commands even better. The battle felt very satisfying and very fast, the animations were simple, but still in the same theme as the rest of the UI and sprites, so the immersion was never broken. The game had no sounds at the time, so I had to put on some music on my own, but that will be fixed in the future. Upon destroying the enemies, I was able to collect Metal, warp to my Space Station and convert it to Energy to repair my own ship. After the first encounter and successful victory, I felt strong and so I went to take over the first enemy Space Station, all I needed to do was to destroy 10 enemies to claim it my own. And… so I got destroyed. There was a lot to learn about combat tactics…. Wish I knew that the Command Console has a working TAB completion system implemented!! DRADIS is a very polished and good looking space simulation game. The version I played had some bugs that have been fixed by now, so there is no need to mention them here. The game feels very fast as you really have to type in commands fast to win combat situations, and that can be tricky. Precision and speed of typing are the two skills you have to master. I would also point out that this is a great game if you want to practice your typing. The sprites are simple, but very clean. The User Interface has a neat layout but in my honest opinion should have more interactive elements. Icons that flash when your guns are locking on target or when they are recharging. The space map stays true to the simple style of the game; consistency is always a sign of good design. I would like to see some animations on the space map in the future. The combat animations are again simple but satisfying, they help to keep the immersion and illusion that you are a commander behind a computer console. Speaking of computer consoles – the BEST for last. The screen effects, the glitches, the scan-lines are just amazing. They make you enjoy the game much more, sometimes a glitch will hide an enemy or a UI element on the screen, making it more believable that you are actually commanding a ship from a console. Very neat touch to the game and something that I found myself admiring multiple times during my game play. There were no sounds in this version of the game but I hope to see them included soon. No music yet, hoping to get some space themed music, maybe multiple songs that shuffle randomly. The game is NOT easy. It is not hard, but it is challenging and you will find yourself cursing a lot after making a typo and missing that final shot that could have saved you. The learning curve is smooth as the tutorial exposes you to all the core commands and the integrated help screen is always only one command away. As you can see in the video that is attached to this article, I had a lot of fun. I mean A LOT. After recording the video, I came back to the game to play again and try to capture the enemy space stations and once there was a new version out, I downloaded it straight away to test the new added content and functionality. The developer released multiple updates since I last played so make sure to check the latest version yourself. I really hope to see this project progress and ultimately be released to the public. It is already a game worth playing and if there will be more content in the future (as I believe there will be) I will not hesitate to support the developer. Thank you all for your time & Stay Tuned!